CLICK HERE to listen to episode audio (5:09). All Web addresses mentioned were functional as of 5-25-18. From the Cumberland Gap to the Atlantic Ocean, this is Virginia Water Radio for the week of May 28, 2018. This is the fourth of a series of four revisits this month to previous episodes on the watershed connections of western Virginia rivers. This week, that excerpt of “Samuel Mason,” by Andrew and Noah VanNorstrand on the 2010 album, “All the Good Summers,” sets the stage for reversing this show’s eastbound opening line, because this episode looks west, away from Virginia’s Atlantic coastline, back to the Cumberland Gap, to the Ohio River Valley, in the Mississippi River and Gulf of Mexico watersheds. You’ll hear a series of sounds that represent past or present connections between the Ohio Valley, or basin, and Virginia’s land, waters, and people; then I’ll follow each sound with a short description of the connection. Here goes! That cannon sound, from the James River Batteau Festival, represents the Ohio Valley’s role in the French and Indian War, between England and France over control of North America. Virginia’s colonial charter gave it a claim to the area of the upper Ohio River, and George Washington was involved in the conflicts near modern-day Pittsburgh that touched off the war in 1754. England’s victory in 1763 gave it control over the Ohio valley and validated Virginia’s legal claim, which would become even more important after the Revolution. This batteau horn sound, again from the James River Festival, recalls the river boats that were one of the ways hundreds of thousands of Virginians traveled into and through the Ohio Valley, during waves of migration from the late 1700s to the mid-1800s. At that time, much of the area was Virginia’s northwest frontier—for example, Fort Henry, in the Samuel Mason song you heard, was at the site of today’s Wheeling, West Va., which until the Civil War was part of Virginia. Unlike Samuel Mason, however, most of those leaving Virginia for fortune and fame did not become river pirates, but instead found new places to work and settle. Rapids in the Virginia’s New River represent the river corridors and watershed connections that influence the Ohio Valley’s human settlement, navigation, fish, other aquatic organisms, and water quality. Besides the New, Virginia rivers whose water ultimately flows to the Ohio include the Big Sandy, Clinch/ Powell, and Holston. The sound of an Ohio River barge in Pittsburgh, where the Allegheny and Monongahela rivers converge to form the Ohio, underscores the commercial and industrial role of the Ohio and its tributaries, which comprise over 2800 miles of navigable waterways. 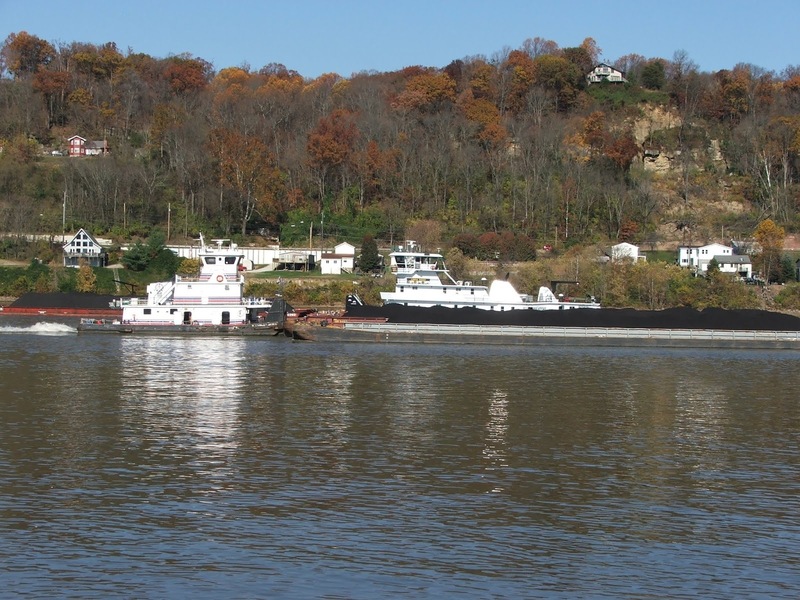 According to the Ohio River Valley Sanitation Commission, as of 2018 over 180 million tons of cargo were being moved annually on the Ohio River, with coal being the most commonly transported product. Finally, a saxophone player on the Roberto Clemente Bridge in Pittsburgh, on a windy and rainy baseball-game day, seems a good symbol for the human spirit, independence, and enterprise that—combined with rivers and other defining geographic features—have helped make the Ohio River Valley a key part of the United States ever since it was Virginia’s northwest frontier. This episode revises and replaces Episode 274, 7-13-15. “Samuel Mason,” from the 2010 album “All the Good Summers,” is copyright by Andrew and Noah VanNorstrand and Great Bear Records, used with permission. More information about Andrew and Noah is available online at https://andrewandnoah.bandcamp.com/. This music was previously featured in Virginia Water Radio Episode 232 (9/22/14). The riverboat horn and cannon sounds were recorded at the James River Batteaux Festival in Lynchburg, Va., on June 15, 2013. The river barge sound was recorded in Pittsburgh, Penn., on June 28, 2015. The saxophone player was recorded on Pittsburgh’s Roberto Clemente Bridge on June 28, 2015. Click here if you’d like to hear the full version (2 min./22 sec.) of the “Shenandoah” arrangement/performance by Ben Cosgrove that opens and closes this episode. Information on Mr. Cosgrove is available online at http://www.bencosgrove.com. Map of Virginia’s major river basins (or watersheds). The Virginia portions of the Ohio River basin are shown at the lower left: blue for the New River watershed, purple for the Holston watershed, yellow for the Clinch-Powell watershed, and green for the Big Sandy watershed. Map from the Virginia Department of Conservation and Recreation, “Virginia’s Major Watersheds,” online at http://www.dcr.virginia.gov/soil-and-water/wsheds. Basin (or watershed) of the Ohio River. Map from the U.S. Army Corps of Engineers, ‘Planning Center of Expertise for Inland Navigation/Ohio River Basin Profile,” online at http://outreach.lrh.usace.army.mil/Basin/OhioRiver/default.asp. Coal barge on the Ohio River at Huntington, W. Va., Nov. 6, 2011. 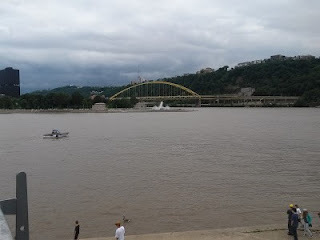 June 28, 2015, view of Point State Park in Pittsburgh, Penn., marking the convergence of the Allegheny River (left foreground) with the Monongahela River (left background, behind the point) to form the Ohio River (right background). Fort Henry was an active fort from 1774-1784 at the place where Wheeling, West Virginia, now is located. (The state of West Virginia established as a state on June 20, 1863, by the U.S. Congress, which at the time had military control of that part of the then-Confederate state of Virginia.) First called Fort Fincastle for one of the titles held by Lord Dunmore, a Virginia colonial governor, the fort was later renamed to honor Patrick Henry. Born in Norfolk in 1739, Samuel Mason was a Revolutionary War soldier and a farmer on the western Virginia frontier, but in the 1790s he became one of the most notorious pirates targeting riverside dwellers and boat traffic, particularly in the area around Hurricane Island and Cave-in-Rock on the Ohio River in Illinois. Mason’s killing in 1803 helped lead to the end of well-organized piracy on the Ohio and other waterways on the early U.S. frontier. Samuel Mason is the focus of Virginia Water Radio Episode 232 - 9/22/14. In 1754, George Washington led a military expedition to the Forks of the Ohio (now Pittsburgh) to drive out the French from Virginia’s northwest frontier. This expedition helped lead to the French and Indian War over control of the Ohio Valley—the North American part of a global, long-running war between England and France. In 1784, Virginia gave up claims to lands north of the Ohio River, the present-day Ohio, Indiana, and Illinois (but kept the future West Virginia). In the southern part of this territory, just north of the Ohio River, an area known as the Virginia Military District was established to offer settlement areas for Revolutionary War veterans. In 1790, Virginia was the largest state (by population), and it produced the state the largest number of migrants in the Ohio River valley and beyond from the 1700s to the 1800s. P erhaps as many as a million Virginians migrated out of the state. In the early to mid-1800s, much of this migration used the river valleys of western Virginia and eastern Tennessee to reach the Ohio Valley and beyond. Before the Civil War, the Ohio River and Valley were also key areas for slaves seeking to escape along the Underground Railroad. Virginia’s watersheds are divided most broadly into those on the Atlantic slope (including watersheds within the Chesapeake Bay watershed) and those in the Ohio River basin (see map above in the Images section). The Ohio River basin, particularly the particularly the upper Tennessee River system, has a notably larger number of native fish species than does the Atlantic slope. Encyclopedia Britannica, “French and Indian War,” online at http://www.britannica.com/event/French-and-Indian-War. David Hackett Fischer and James C. Kelly, Bound Away: Virginia and the Westward Movement, University of Virginia Press, Charlottesville, 2000. Robert E. Jenkins and Noel M. Burkhead, Freshwater Fishes of Virginia, American Fisheries Society, Bethesda, Md., 1994. Filson Historical Society (Louisville, Ky.), “The First American West: The Ohio River Valley 1750-1820,” online at https://filsonhistorical.org/?s=The+First+American+West. Minnie Lee McGehee, ed., River Boat Echoes: Batteaux in Virginia, Virginia Canals and Navigations Society, McLean, Va., 1995. National Park Service/New River Gorge National River, “Batteaux on the New,” available online at http://www.nps.gov/neri/learn/historyculture/batteaux-on-the-new.htm. 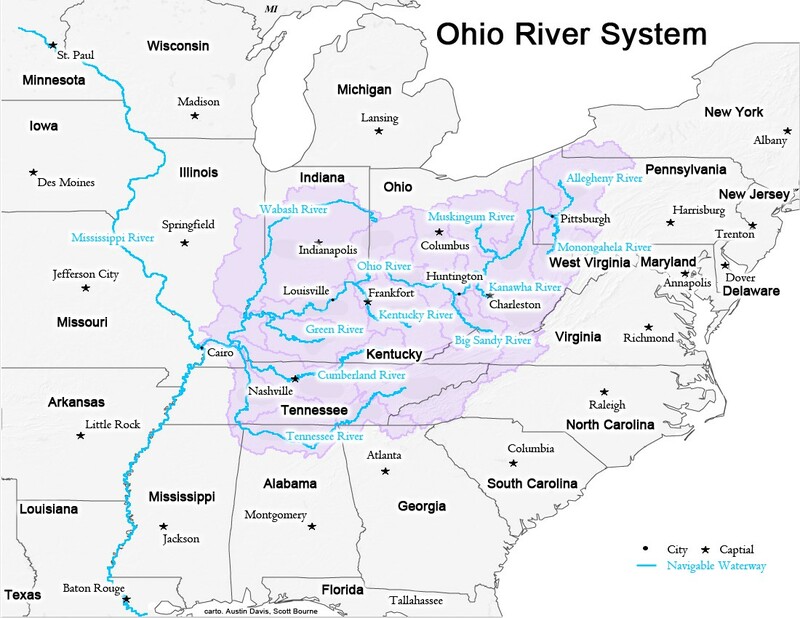 New World Encyclopedia, “Ohio River,” online at http://www.newworldencyclopedia.org/entry/Ohio_River. Ohio River Valley Sanitation Commission (ORANSCO), “River Facts,” online at http://www.orsanco.org/river-facts/. U.S. Army Corps of Engineers, ‘Planning Center of Expertise for Inland Navigation/Ohio River Basin Profile,” online at http://outreach.lrh.usace.army.mil/Basin/OhioRiver/default.asp. U.S. EPA, “EPA’s Work in the Gulf of Mexico,” online at http://www.epa.gov/gmpo/index.html. Virginia Department of Conservation and Recreation, “Virginia’s Major Watersheds,” online at http://www.dcr.virginia.gov/soil_and_water/wsheds.shtml. Virginia Tech Department of Fish and Wildlife Conservation, “EFish—The Virtual Aquarium,” online at https://efish.fishwild.vt.edu/. Mark J. Wagner and Mary R. McCorvie, “Going to See the Varmint: Piracy in Myth and Reality on the Ohio and Mississippi Rivers, 1785-1830,” in X Marks the Spot: The Archeology of Piracy, Russell K. Skowronek and Charles R. Ewen, eds., University of Florida Press, Gainesville, 2006. Waterways Council, Inc., “Waterways System,” online at http://waterwayscouncil.org/waterways-system/. West Virginia Division of Culture and History, “Story of Fort Henry,” online at http://www.wvculture.org/history/journal_wvh/wvh1-2.html. West Virginia Division of Culture and History, “West Virginia Statehood,” by A.B. Brooks, online at http://www.wvculture.org/history/statehoo.html. All Water Radio episodes are listed by category at the Index link above (http://www.virginiawaterradio.org/p/index.html). See particularly the “Rivers, Streams, and Other Surface Water” subject category. 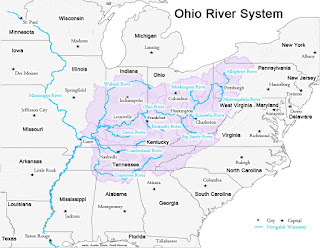 Following are links to some other episodes on waters in the Ohio River watershed. Episode 109, 5/7/12 – “Banks of New River” by Whitetop Mountain Band. Episode 177, 9/2/13 – “Sandy Boys,” by Sara Grey, for Labor Day. Episode 179, 9/16/13 – Twenty-two Miles Along the New River Trail. Episode 232, 9/22/14 – “Samuel Mason” by Andrew and Noah vanNorstrand Recalls a Notorious, Virginia-born River Pirate (on piracy on the Ohio River in the 1800s by Virginian Samuel Mason). Episode 264, 5/4/15 – A Bird Day on the New River. Episode 419, 5/7/18 – Meet the Big Sandy Watershed with “Three Forks of Sandy” by Bobby Taylor. Episode 420, 5/14/18 – Exploring Virginia’s Tennessee River Tributaries Through “Clinch Mountain Quickstep” by Timothy Seaman. Episode 421, 5/21/18 – Connecting Southwestern Virginia Waters to the Ohio River Through “Ohio Valley Rain” by Cornerstone. USI.2 – major land and water features of North America, including their importance in history. WG.3 – how regional landscapes reflect the physical environment and the cultural characteristics of their inhabitants. WG.5 – regions of United States and Canada. Following are links to previous Water Radio episodes (various topics) designed especially for certain K-12 grade levels.